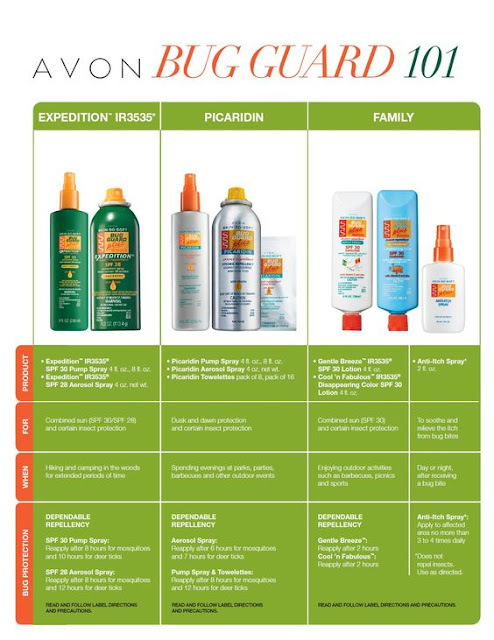 It has been many years since Avon introduced their first Bug Guard products under the Skin So Soft brand name*, and they are still an important tool in the arsenal against those nasty mosquitoes and other pests that we must deal with each summer. The product line has been expanded and improved upon and is completely DEET free. Bug Guard is one of the products that most representatives stock up on, because when the bugs come you want to be ready. The ingredients in Bug Guard (IR3535 and Picaridin) are recommended by the CDC for protection against the Zika virus. Here's a handy guide to the products in the Bug Guard lineup, to help you decide which ones are right for you. I'm planning to do a post about fundraising with Avon soon, but you might be interested in doing a Bug Guard Fundraiser for your organization this summer. Here is the flyer showing the options available. Please get in touch with me if you want more information about Avon Fundraising now.